Coverage of the 2006 Pequot Conference and Avon High. The CIAC's new score management policy that dictates that coaches of high school football teams that win by 50 points or more must be suspended one game is a poor lesson to our children. What happens in life? If things get tough, you need to adapt, learn new skills and take a new approach. You can’t wallow and try to legislate fairness into life because life isn’t fair. No one likes getting beat by a big score. It’s annoying. It’s frustrating. It can be embarrassing. But that is the point. It is memorable. It can be an incentive to change. We need to challenge our children, not coddle them. In the face of adversity and challenges, people, athletes and coaches will find a way to get better. Let’s give them that opportunity. n Click here to read the entire Connecticut Sports Online editorial. NEW HAVEN, Dec. 2 – When the high school football polls come out next week, Ansonia (13-0) will sit atop them as the No. 1 team after winning its record 15th CIAC state championship with a dominating 34-12 victory over Bloomfield at Southern Connecticut State University today. But if one was to slight the only undefeated team left in the state, Greenwich (12-1) would be the perfect team to hoist to the top spot after its very impressive 28-7 win over previously undefeated Southington. Greenwich, which looked flat and vulnerable in a 20-0 loss to Staples on Thanksgiving, kept Southington’s high-flying offense off the field in the second half and ran over the Blue Knight defense as they broke open a tight 7-7 game at halftime. Led by leading rusher Jonathan Meyers (12-112), the Cardinals marched 56 yards on 11 plays (all runs) to score on its opening possession of the third quarter and take a 14-7 lead. “Meyers is tough to stop without a hole. If you give him a little hole, he is unbelievable,” Greenwich coach Rich Albonizio said. Southington attempted to match, driving 72 yards to its own three yard line. QB Paul Clements, who completed just one of his first 11 passes, completed five straight in the drive. But on third and goal from the three, the Knights were penalized for illegal motion. After Clements was stopped for no gain, Greenwich blocked the attempted field goal from Southington’s Joe Izzo. Greenwich quickly responded as QB Joseph Polestsky (3-7-1, 127) found James Dunster streaking down the sideline for a backbreaking 67-yard TD strike and a 21-7 lead. Dunster was playing with a separated shoulder and a broken bone in his clavicle. A second 11-play scoring drive (all running plays) iced the game for Greenwich. Dunster had one of the key hits in the game. With Greenwich ahead 7-0 in the second quarter, Southington looked like it was putting a drive together. On fourth and 11 from their own 44, punter Garry Coles lofted a 26-yard pass to receiver Nick Florian, who caught the ball for a second before he was belted by Dunster and the ball fell to the turf incomplete. “My heart is still pounding,” Albonizio said. “To beat a great team like that. I can’t speak. For the first time in my life, I’m speechless.” Greenwich had lost four straight times in the finals since they last won in 1999 over Southington. Ansonia also broke open a tight ballgame at halftime. The Chargers held a 7-0 lead at halftime but flattened Bloomfield in the third quarter. The Warhawks lost 11 yards on its first drive before punting. Ansonia responded by handing the ball to Alex Thomas seven times on a eight-play scoring drive to take a 13-0 lead. On Bloomfield’s next drive, they threw two passes. One was incomplete and one was intercepted. Thomas responded with a 56-yard TD run on the next play. When the Chargers kicked off, the ball bounced off a Bloomfield defender and Ansonia recovered. The Chargers scored four plays later on a 24-yard TD pass to Thomas Pitney from Taylor King and a 27-0 lead. In nine minutes and 11 seconds, Ansonia won its title. Ansonia was ranked No. 1 in the most recent state coaches and writers polls. 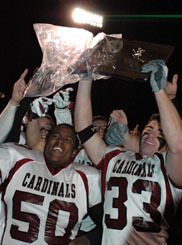 Click on this link for results from the remaining four CIAC state championship football games. 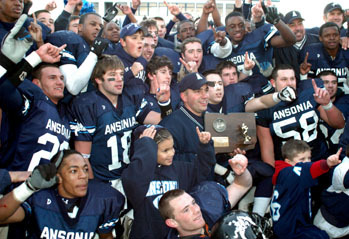 Ansonia, left, and Greenwich celebrate winning football state championships.